"He was sweating a lot and in the last training session we've decided to change the shirt" said his Uncle Toni. Nadal likes to play with the shirt tight to his body, but from now on and until the tournament ends, he will play with a shirt that's one size bigger so the fabric doesn't stick to his body. "He was dripping sweat from the first few games" his locker rooms colleagues said. 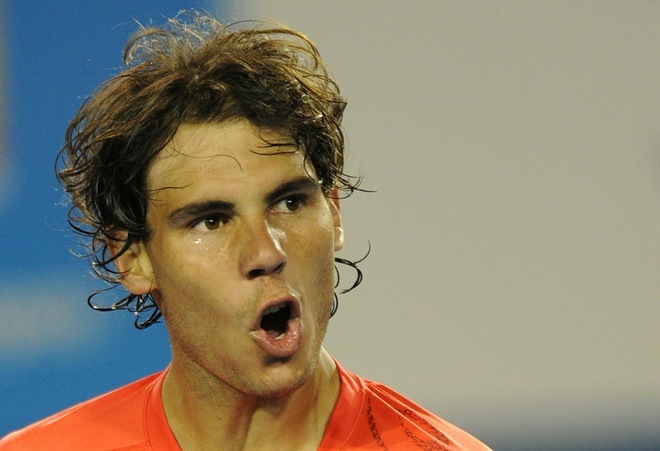 "He was sweating heavily and in the last test we changed the shirt," says his uncle Toni. Nadal likes to play with the texture close to the body but, from now until the end of the tournament, will look a whole size too big to not stick well to the skin tissue. "I was dripping from the first game," said co-costume. Angel Ruiz Cotorro, medical staff and the Federation player moved to Australia, admits that "the thermoregulation of the body has, at times, alterations and Rafa is now in the process. It is not normal for him to lose two kilos and a half playing three sets, but they recover quickly with sports drinks, "he continues. The Number 1 player, drinks in Melbourne, Recuperation, an isotonic drink with glucose, fructose and mineral salts. He has to hydrate himself more and better, before, during and after matches to equilibrate the physical exhaustion caused by so much sweating. "He'll have to start eating food rich in carbohydrates, like bananas, even minutes before going on court" said Cotorro. "The first positive change is that I did not sweat as half as the other day. I guess the evolution is better everyday that passes. While training, I've been better and I've sweat less. And during the match I sweat nothing like the other days", he said after beating Cilic. "With the shirt I have several options and this time I chose one that's one size bigger. It doesn't fit me as well as the other, but I've come here to make a good tournament and not to show my shirt." In training yesterday, that lasted for two hours, tested the new equipment, three sizes too big, seconded by Roy Tuts Tamaguchi and Robert Jordan, the two strongmen of the product in the U.S. multinational Nike. "We are working to solve the problem," says Tuts, which has on its agenda to other icons of the brand of stick like Pau Gasol, Ricky Rubio and Juan Carlos Navarro.